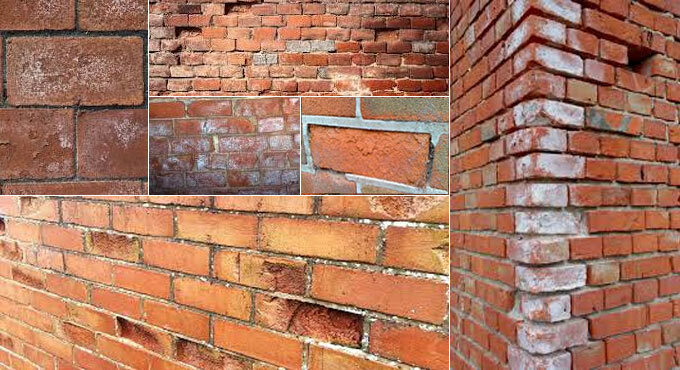 Freezing and thawing water in brick leads to flaking and spalling and due to these the bricks are damaged severely. In this construction article, you will get some useful tips for recognizing spalling on bricks. Besides, you will learn how to take proper measures so that the water can’t enter into the brick walls. Otherwise, it will be necessary to substitute the damaged bricks. The brick retaining wall under a wood fence may be broken down. The flaking surface is a good instance of “spalling,” a type of failure resulting from moisture and the freeze/thaw cycle. Water from rainfall, melting snow or even wet soil soak the brick to some extent, and freeze inside the brick while the temperature is decreased. The small development of freezing water will rupture the brick. If freezing and thawing occur in continuous basis, the fractures are expanded unless the brick is perfectly decomposed. To get rid of these issues, bricks utilized on the outside should normally become tougher and solid (less moisture absorption). A softer brick in the wall that is mixed in the load may collapse. If massive failure occurs, there is serious water intrusion issue. The outside walls should be detailed cautiously to discharge water, specifically when they’re inherent section of a retaining wall. There should be a coping or cap on the wall to discharge the rain water. It comprises of metal flashing, concrete or special bricks which are angled to keep water far from the top of the wall. The cap exists there for one time, but it may be eliminated or tired. Besides, the wood fence over perhaps catches and directs even more water down onto the wall. While going to reconstruct your brick wall, ensure it’s designed to reduce water penetration. Aside from a cap on the top, it should contain good draining fill (gravel) along the backside and weep holes along the bottom to lessen water pressure when the soil gets soaked. Damp-proofing the backside of the wall will also facilitate the water to be discharged properly. There should be good drainage system around the base to resist penetration of water from below. Circular saw, Cold chisel, Dust mask, Extension cord, Hammer, Hearing protection, Level, Safety glasses, Sledgehammer, Spade, Tape measure, Trowel, Utility knife, Wheelbarrow. A masonry blade is also necessary to cut the brick with circular saw. Brick, Drain tile, Gravel, Landscape fabric, Mortar.